“e-Commerce” may be starting to sound like a tired buzz word, but make no mistake: the growth of online sales is nothing to take lightly, even in the aftermarket parts sector. As the data comes in for the past year’s sales, we’re getting a better picture of how the online marketplace is changing. More than ever, buyers are turning to online tools to help with shopping, whether they’re ordering items at home, on the go, or even making decisions inside a store. Most of that growth has centered around smartphones, making it more important than ever to have a solid mobile presence. In the past year, the biggest growth area in e-commerce has been focused squarely on growth through mobile devices. There are over 125 million smartphone users in the United States, and 62% of these people have made online purchases from their phones in the last six months. What does that translate to for overall sales? Last holiday season, shoppers used smartphones for 1/3 of all online purchases. For those businesses with a physical location, e-commerce is still important. Last year, 40% of sales for Black Friday at brick and mortar stores came from online sales. Even when buyers are coming to your stores to buy, over 80% used smartphones in-store to look up product information and reviews or to search for other locations where they can find the products they need. Do you know what size or type of air filter or brake pads are on your car? Unless you just had them replaced, there’s a good chance you don’t know whether you have cylindrical or flat paper air filters or semi-metallic or ceramic brake pads or what size you need. If you were to start shopping for either right now, you’d probably walk out to your vehicle, take apart the air box or take a wheel off to find out, and type the information into your smartphone. A recent study by Google shows a massive increase in tire-related searches using mobile devices. Like air filter and brake pad searches, it’s just one facet of a growing trend toward mobile aftermarket parts sales. Unlike other forms of advertising like TV and mass mailing, online advertising effectiveness can be measured with extreme accuracy, down to each individual click. Google’s latest report on Adwords advertising shows a major shift toward mobile access when it comes to finding aftermarket parts. As the single largest starting place for car part searches on the Internet, these results are nothing to sneeze at. What can we learn about mobile devices and social media when customers are interacting with and ordering from parts suppliers? What are online customers looking for? UPS did a study trying to find out so they could work with retailers on providing better shipping options. In a previous blog, we talked about how the study shows a shift in online orders growth from niche performance products via online-only suppliers toward major growth in replacement parts sales, particularly for traditional brick and mortar stores. This time around, we’ll look at what we can learn about mobile devices and social media, two recent additions to the options customers have for interacting with and ordering from parts suppliers. Social networking gives normal people a voice, both for sharing news between themselves and for interacting with companies. Two thirds of online parts shoppers use social networking sites, but it’s not evenly split between the sexes: of those surveyed, 76% of women used these sites compared to just 54% of men. While platforms like Twitter and Instagram have made strides in recent years, Facebook is still the most popular social networking site among customers. 26% of buyers say social media influences purchase decisions, but the most influence isn’t where you’d expect it. 24% of buyers getting upgrade parts said social media influenced their purchases, compared to 31% of those buying replacement parts. It’s the people looking for a part that works rather than a part that they can show off who are turning to social media for information. Social media isn’t just about external sites: giving your customers a voice can have a major impact on how they view the usefulness of your online presence. 71% say that reviews are an influential part of the online retail experience, and 58% find ratings and reviews helpful, making it the most important feature of a retailer’s website. Where does mobile fit in for these buyers? There are still kinks to work out on mobile platforms since they are relatively new, so it shouldn’t be a surprise that only 79% of users are satisfied with their mobile experience compared with 84% of users on larger devices including computers and tablets. Despite this gap, these shoppers are far more satisfied with these options over in-store shopping, which had a satisfaction rate of just 65%. No matter where they’re buying, 41% of shoppers use their phone to read product details so they can make better purchasing decisions. Mobile use is wildly different between the sexes: men are almost twice as likely as women to look for stores, research products and track deliveries on their smartphone. However, when it comes to installing a part, women are almost as likely as men to do it themselves. Customers of both sexes are looking for more convenience using online tools. 63% would like an email or text with an approximate time of delivery, 62% would like to authorize delivery beforehand instead of needing to be home to sign for a package, and 45% want electronic receipts via email or text. What about the future? It should be no surprise that Millennials, those between the ages of 18 and 34, like to use mobile devices and social media more than older customers. If you have a mobile-ready website or app, you’re already catering to them since Millennials 34% of their parts shopping on their phones, compared to just 2% of older customers. The number one thing Millennials look for when visiting a parts store online is fitment data. 47% of them are likely to promote brands they like using social media, and 36% say social media has an influence on their purchases. What lessons can we learn from all these numbers? Customers use online and mobile access because they want more information about what they’re buying. Men use mobile tools to track packages and find stores, women and millennials are the biggest users of social media, and everyone wants online services to make delivery more convenient. Lastly, the overwhelming popularity of mobile and social media usage among Millennials hints at a trend of increased usage in the future. Vertical Development can help you be there for your online and mobile customers. Our ShowMeTheParts database is built to be used on mobile platforms with small screen friendly interfaces, HTML5-based tools that work in mobile browsers, and apps for iOS and Android. As the largest public parts database on the market with full access to photos, technical documents and 360 degree views on smartphones, we can help you deliver the information your customers want. Call us at (847) 609-9540 or email sales@verticaldev.com to get started today! KYB Americas Corporation, an industry leading supplier of shocks and struts, recently partnered with Vertical Development, Inc. to add an all-new license plate lookup feature to its mobile app. 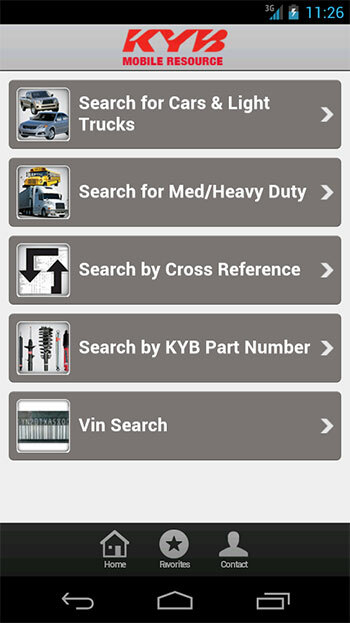 The KYB app, available for both iPhone and Android devices, makes it easy for aftermarket professionals to find the correct shocks and struts among more than 3,300 items in the KYB catalog. With this added feature, the KYB app can now zero in on the proper parts using a vehicle’s license plate number. 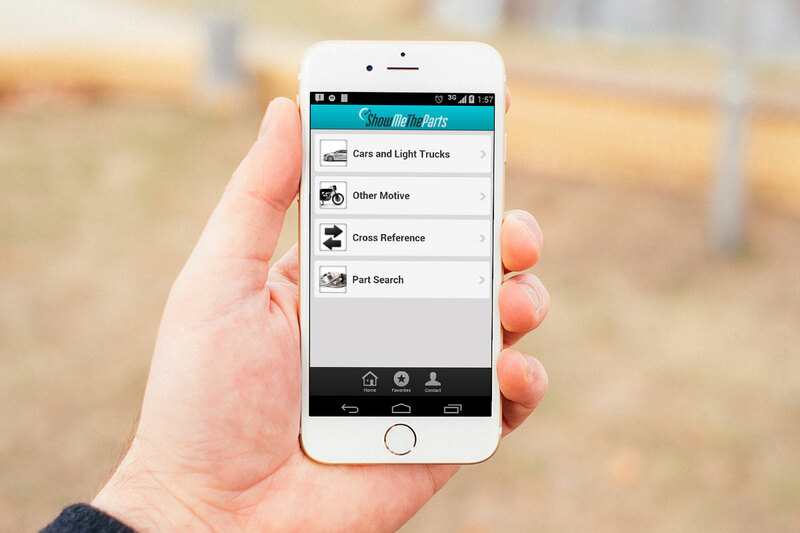 KYB’s mobile app integrates the regular updates from ShowMeTheParts, along with the accuracy of license plate lookups to ensure that shops feel confident about installing the correct shocks and struts for a job. “KYB is delighted to share the new license plate lookup functionality through our mobile app and online catalog, both powered by Vertical Development’s ShowMeTheParts. We upgraded our KYB cataloging with this new license plate lookup feature to help the service provider reduce the time it takes to look up parts and avoid mistakes,” shared Tim Oldiges, product manager for KYB Americas Corporation. KYB turned to ShowMeTheParts because it is the most up-to-date public parts catalog available – with information on over 300+ suppliers and manufacturers of aftermarket replacement parts. With lighting fast turnaround time, users can be assured the information is the most current available and published in the way the supplier intends it. Each year, KYB publishes an extensive catalog with meticulous details on its product lines. 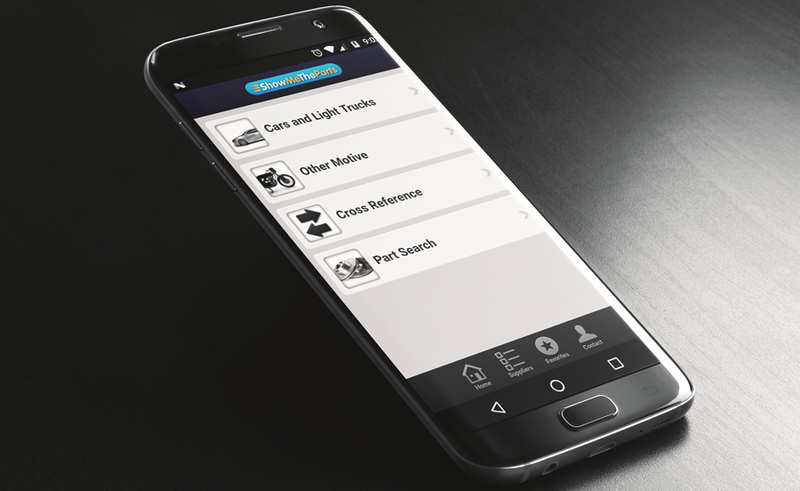 With the ShowMeTheParts integration, KYB adds entries as soon as products are released, and users always have the most recent information when searching for shocks and struts using the KYB mobile app. For corporate sales departments, we’ve improved our already robust mobile solution so that field sales teams are able to show their products in a most-efficient manner. To put ShowMeTheParts software to work for your brand or company, call us at (847) 609-9540 or email sales@verticaldev.com. Covering 1.7 million parts with 4.4 million attributes and 8.7 million interchanges, ShowMeTheParts is the largest public parts database on the market. However, this database can also be pared down to fit specific needs without losing the depth of its content. For Exide Technologies, that means using ShowMeTheParts to help its retail partners find the right batteries for their customers, no matter the application. As one of the world’s largest producers of batteries, Exide supplies products for private label brands as well as its own. By working with aftermarket tech leader Vertical Development, the company was able to utilize ShowMeTheParts for access to data on both types of product lines, creating a turn-key solution for retailers adding batteries to their stores. More importantly, by using a digital format for delivering product data, Exide is able to provide retailers and customers with more information than is possible with a print catalog and ensure that the information is always up-to-date. It’s also easier to access, allowing anyone with a computer or mobile device to access the catalog. Mid-States Distributing Company, known as The Heart and Soul of Farm, Ranch and Home, is a 62-year-old cooperative comprised of 43 independent, farm, ranch and home retailers across the U.S. and Canada. Retail stores carry products ranging from pet supplies, power equipment, agricultural and automotive equipment and supplies, sporting goods, clothing and footwear to honey bees — a tremendous amount of variety. Having such a wide range of products means that customers could be looking for batteries to fit anything from marine products to tractors. A print catalog covering all the models and interchanges would be enormous, and with constant model changes, portions of it would always be out of date. That’s why Exide chose to go with ShowMeTheParts when creating a virtual catalog and mobile-friendly battery lookup site. Mid-States partnered with Exide for their Durastart label, as well as some Exide branded products. Together, Exide and Vertical Development have created a mobile-friendly website at DurastartBatteries.com, so stores and customers alike can get parts information as soon as they start keeping stock. 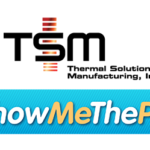 “Implementing the ShowMeTheParts web catalog in both the desktop and mobile platform provides Exide customers like Mid-States with up-to-date application information for all the segments they serve, while covering the wide range of years their customers need. That is just not practical in a print format,” shared Lee Wilson, product information manager at Exide Technologies. “Exide’s retail partners and consumers enjoy the convenience of having this data readily available and easy to access giving them the ability to search for their application and product information needs from any computer or mobile device,” he concluded. With Exide adding information with each product release, the stores selling these batteries will always have the latest information right at their fingertips, and it’s still as accessible as any other ShowMeTheParts website or mobile app. What if a store doesn’t have a specific battery in stock? By including dimensions and other specifications in the database, customers have the information they need to ensure they’re getting a perfect match even when they can’t compare old and new batteries side by side. Ready to partner with Vertical Development to deliver your products more quickly and seamlessly to customers? Give us a call at 847.609.9540 or email sales@verticaldev.com. Recently, Vertical Development launched a collaboration with AP Exhaust Technologies, Inc. to power its new mobile app. The new AP Exhaust app, available for both iPhone and Android devices, makes it easy to find the correct part for one of the most strictly regulated pieces on cars today — catalytic converters. The AP Exhaust app zeros-in on the proper converter using information from the VIN, either by scanning a barcode or by entering the vehicle’s license plate number. 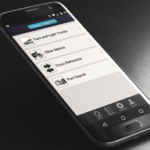 AP’s mobile app couples regular updates from the ShowMeTheParts database with the accuracy of VIN and license plate lookups to allow shops to feel confident that they are installing the correct converter. 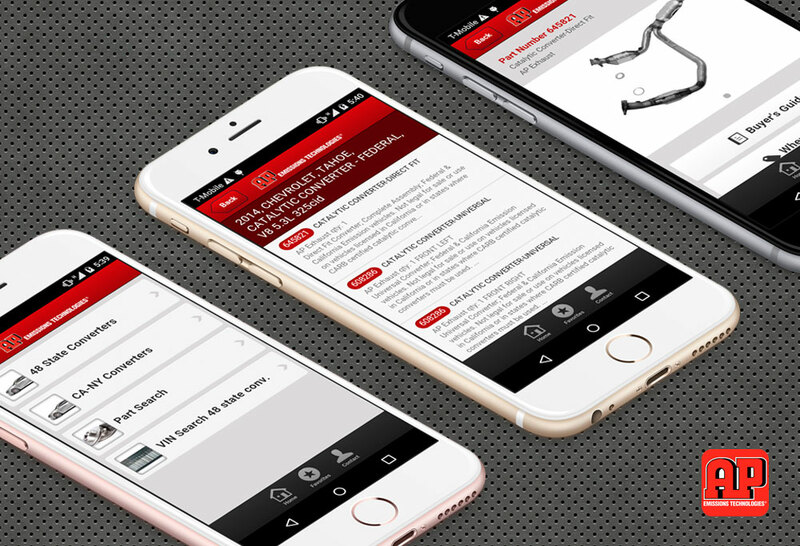 “AP Exhaust is thrilled to announce the launch of our new mobile app, powered by Vertical Development’s ShowMeTheParts. Mechanics will find the license plate lookup feature most useful, since they will know the correct replacement parts for a vehicle upon the customer’s arrival or even when taking an appointment over the phone,” shared Gary Nix, director of marketing for AP Exhaust Technologies. “Utilizing the ShowMeTheParts database and search functionality, the AP Exhaust app matches a license plate number with the correct VIN. The result is a list of compatible parts from all of AP’s lines, from ANSA and AP stock solutions to XLERATOR® and Silverline™ performance exhausts,” he concluded. ShowMeTheParts is the most up-to-date public parts catalog available – with information on over 300+ suppliers and manufacturers of Aftermarket replacement parts. With lighting fast turnaround time, users can be assured the information is the most current available and published in the way the supplier intended it. AP Exhaust adds items and interchanges to its lines regularly and releases a series of bulletins every month or two. With a traditional catalog, that would mean mechanics and parts professionals would need to cross-reference dozens of bulletins with the yearly paper catalog to find a match. With the ShowMeTheParts mobile integration, AP can add entries as soon as products are released, so users will always have up-to-date information when looking up catalytic converters using the new AP mobile app. Vertical Development strives to be on the cutting edge of technology. We believe that utilizing the newest tech enables us to accomplish our mission of breaking down any roadblocks that exist between our users and the most current, correct data in the Aftermarket. Ready to partner with Vertical Development to deliver your products to customers via mobile app? Give us a call at 847.609.9540 or email sales@verticaldev.com. 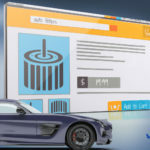 In the 21st century, effective advertising has branched out from the bounds of the TV screen to every computer and touchscreen in the world. Through search engine optimization, businesses can tailor the content of their websites not only to appeal to their target demographics, but also to appear in the top rankings of websites like Google when customers search for their products. The principles of SEO are simple enough: Web designers and copywriters incorporate certain words and phrases into a website’s text so that the site shows up in search results for those same terms. The idea of optimizing is to appear as highly ranked as possible on search engines like Google and Bing. Last year, the world found out that Google uses an artificial intelligence system, known as RankBrain, as part of its ranking software to help refine search results. According to Google, RankBrain is the third most crucial factor in the entire set of ranking algorithms. Additionally, RankBrain has a section of code dedicated to ranking for mobile devices. It helps mobile-friendly websites and apps appear in more advantageous positions in Google searches performed from smartphones and tablets. According to recent data, fully 58 percent of Americans use smartphones; and 42 percent use tablets. On-the-go millennials use smartphones and tablets more often than their computers, especially for shopping. It’s true in the aftermarket industry as well. Aftermarket Business World estimates that just more than half of aftermarket professionals use a mobile device for work. To reach all of these people, it is crucial for companies to have the right products in the right place at the right times to fill those needs, but keeping up with the changes in the tech world can be exhausting for many and downright impossible for most. Vertical Development has been helping aftermarket clients catalog and map information with our industry-leading software for more than 30 years. Our talented and dedicated team of programmers, coordinators and mapping experts work with aftermarket brands to make their catalog data accessible via mobile-friendly websites and apps. All in all, the point of a mobile-friendly website is to make it simple to find information and navigate the site’s contents using a smartphone. By combining your mobile-friendly site with a powerful mobile app, you can provide your customers and staff with a superior overall experience, offering unique features like push notifications for new products. The bottom line is visibility. There are currently more than 20 billion apps in the online marketplace today. You might think most of them are junk, but still one or more could belong to your competition. As mobile search algorithms get smarter and more sophisticated, they will continue to serve up content that is specifically tailored to the needs of mobile-device users, first. Without moving your parts catalog to a mobile-friendly website or app, you’ll be relegated to the bottom of the heap. Ready to partner with us to build your new mobile app? Give us a call at 847.609.9540 or email sales@verticaldev.com.